I went a bit mad a few weekends back. First I did some bleach dying and then I moved on to fabric dye. Summer 2012 is going to be a riot of crazy prints so I decided to jump in early and up-cycle a couple of old T-shirts. 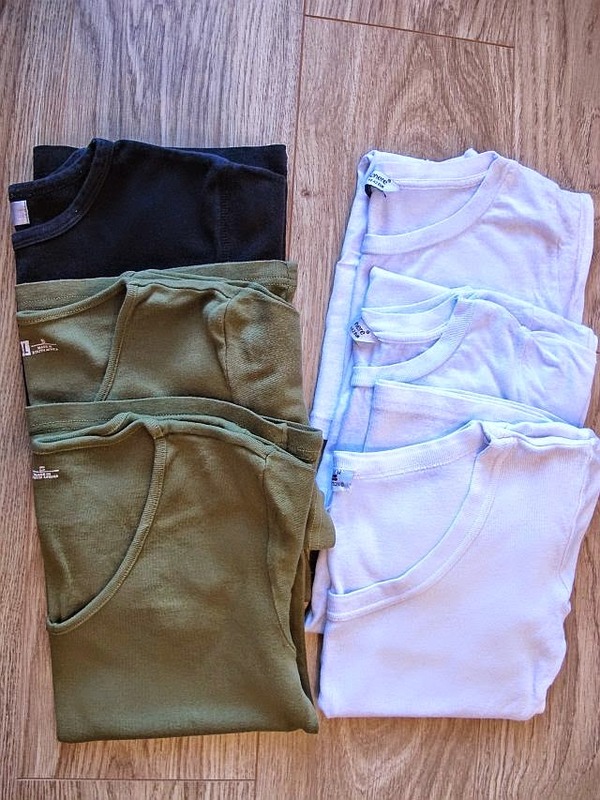 Tatty T-shirts are perfect for dyeing and the effect I got using elastic bands was amazing. I redyed the T-shirt that was previously bleach dyed. 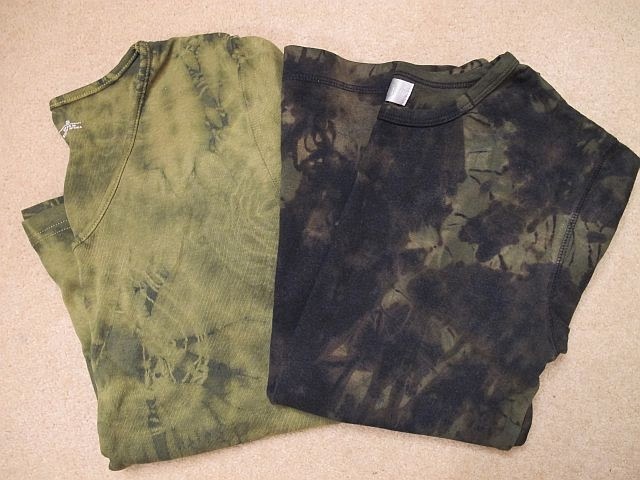 I layered black dye over green dye. I soaked and dipped and just had fun with it. 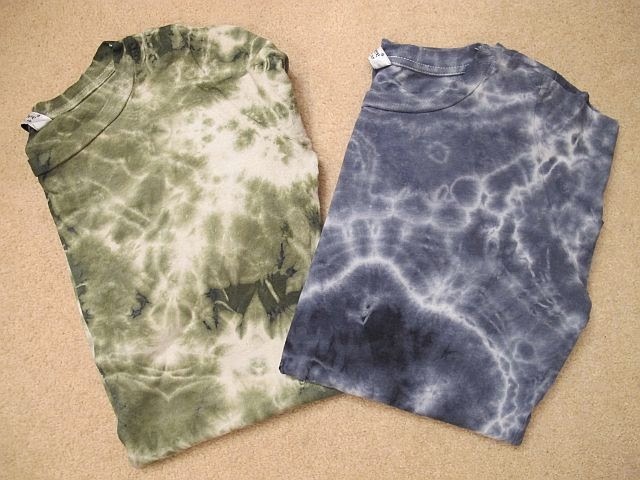 Refer to my bleach dye post for the basics of dyeing before you start – tips for dyeing clothes. You can bleach or dye just about anything. For the marbled effect I rolled up the T-shirts and tied as many elastic bands as I could around them. The tighter the bands the harder it is for the dye to penetrate and the more of the original colour you will retain. Dip dyed hems are dead easy to achieve. Just dip the hems of your skirts, trousers, scarves or shirts into a bucket of dye. I could dip dye my whole wardrobe right now. Love, love that look. You could use a squeezy bottle and dribble dye over clothes. Maybe use a garden sprayer and spray dye randomly over clothes. Or even use a fabric pen and write slogans on your T-shirts. I also folded a big square of cheap muslin into an S shape and dipped each end into a different colour dye. That created amazing colour layers. I wear that piece of muslin as a big fun scarf. The great thing about dyeing this way, is that it’s not supposed to be a perfect neat design. It’s about playing around and a splosh here or there adds to the final effect. And you don’t have to only use commercial dyes. Many natural substances make perfect dyes. 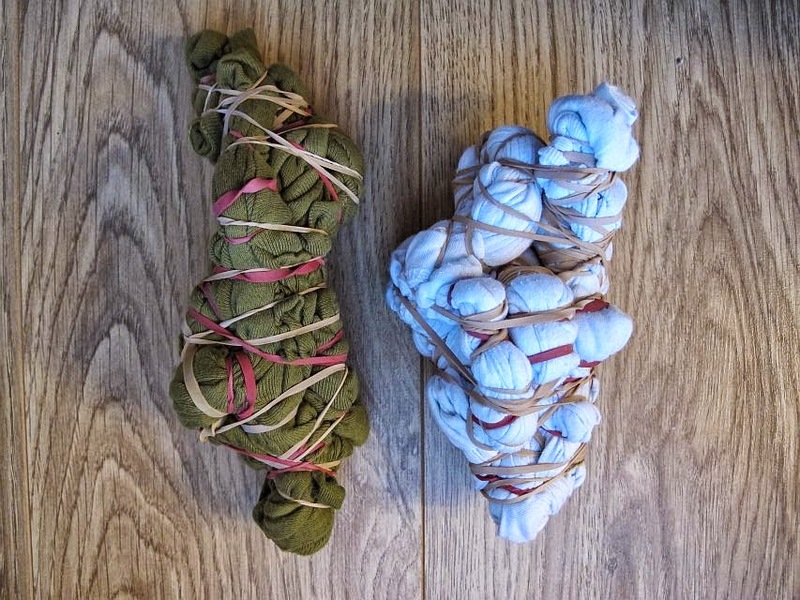 Remember my tea dyed scarf in this post – how to dye with tea. tumeric could be fun to play with. 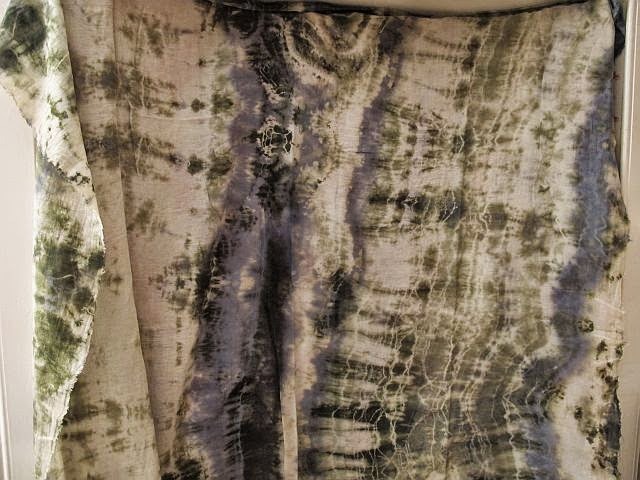 For more follow this link – natural dyeing methods. share YOUR recycled clothing projects on the Greenie Dresses for Less facebook page.